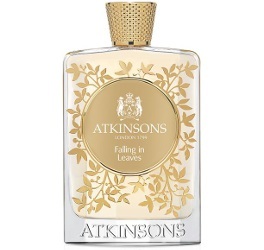 British brand Atkinsons has launched Falling in Leaves, a new fragrance. Exquisitely elegant, Falling in Leaves is a woody oriental scent with a distinctive British charm. Top notes of rhubarb and plum mingle with a magnificent bouquet of roses and peony. At the heart, patchouli and a saffron accord envelops you like a luxurious cashmere wrap. A soft and creamy concoction of vanilla and sandalwood lend an indulgent finish to this divinely feminine fragrance. Inspired by Georgian jewellery boxes, the beautiful glass bottle has been hand-decorated with metal leaves, while the signature cap is plated with 14 karat yellow gold. Additional notes include black tea. Atkinsons Falling in Leaves is available at Harrods, £300 for 100 ml Eau de Parfum. Sounds lovely, but…the price. Ouch. It definitely looks lovely! Luckily it does not otherwise tempt me because boy are you right about the price. Small British ‘niche’ house – they really don’t do themselves any favours with prices like this. Sampled a few of their fragrances when I was in Glasgow last year (heaven forbid anyone in Aberdeen should stock anything other than ‘high street’ stuff!) & will do so again when I can, but the cost is a tad offputting. I think this one is a Harrods exclusive — assume they are trying to get a little slice of the luxury market.